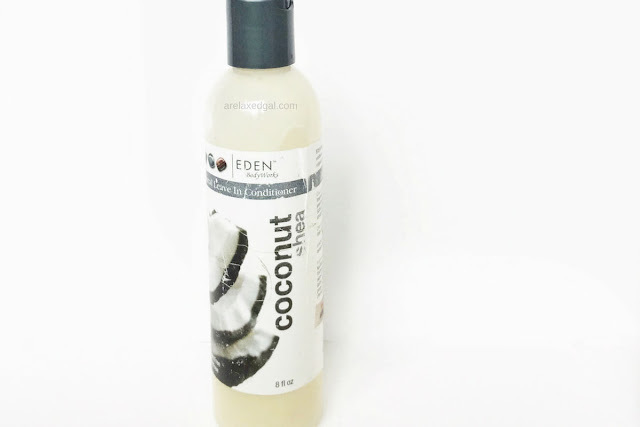 First off I really like the ingredients in the Eden BodyWorks Coconut Shea Leave-In Conditioner. Particularly all of the oils - coconut, jojoba, safflower, and avocado. Not to mention the Vitamin E and Aloe Vera. And it's also sulfate-free. Another thing I like is that my new growth and relaxed strands both respond positively. When I apply this to my new growth and relaxed hair, they both soften up and feel moisturized. 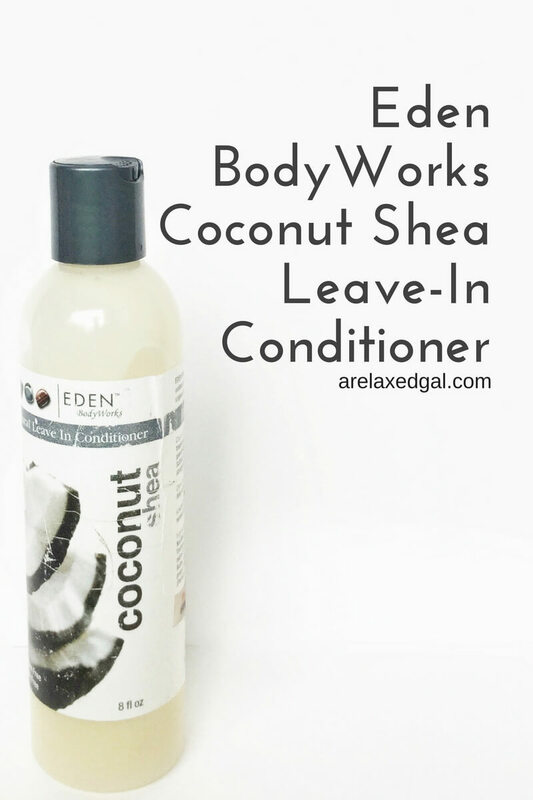 While the Eden BodyWorks Coconut Shea Leave-In Conditioner includes Shea Butter to seal in moisture I do like to follow up with my own sealant, either a serum or natural oil, particularly when I apply it right after a wash. The consistency is thick which is great for my thick hair, but I haven't noticed any product build-up and can use this every day for moisturizing. Now for the things I don't like. I'm not a fan of is the artificial coconut smell, though it doesn't linger. Also, this product really doesn't provide any slip so I need to use a detangler before applying this. For me right now this is a keeper. It moisturizes my hair like no other leave in ever has. Since a little goes a long way I'm still on my first bottle, but have already bought my second bottle. The Eden BodyWorks Coconut Shea Leave-In Conditioner is a "Daily conditioning treatment formulated with one of nature's best moisturizers, Coconut Oil, to penetrate and revitalize tresses. Blended with Shea butter to seal in moisture. Sulfate free formula is safe for color treated, chemically treated, curly, or straight hair." "Apply to freshly shampooed hair for best results. Do not rinse. Use daily as needed." "Water (Aqua), Aloe Barbadensis (Aloe Vera) Leaf Juice, Cocos Nucifera (Coconut) Oil, Simmondsia Chinensis (Jojoba) Seed Oil, Carthamus Tinctorius (Safflower) Seed Oil, Persea Gratissima (Avocado) Oil, Polyquaternium-37, Tocopheryl Acetate (Vitamin E), Dicaprylate/Dicaprate, PEG-50 Shea Butter, Glycerin, Cetrimonium Chloride, Hydrolyzed Keratin, Panthenyl Hydroxypropyl Steardimonium Chloride, Sodium PCA, Polyquaternium-7, Fragrance (Parfum), PPG-1 Trideceth-6, Dehydroacetic Acid, Benzyl Alcohol"
What's your favorite leave-in conditioner?